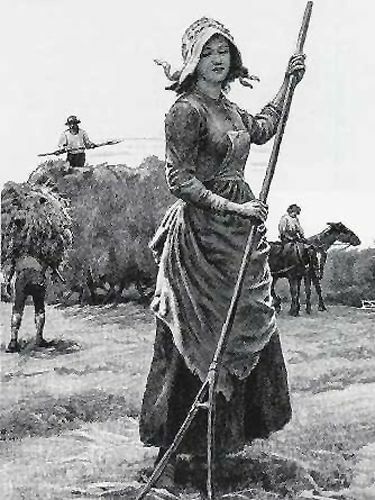 Of all the tens of thousands of devoted women who have accompanied the grand army of pioneers into the wilderness, not but one has been either a soldier to fight, or a laborer to toil, or a ministering angel to soothe the pains and relieve the sore wants of her companions. Not seldom has she acted worthily in all these several capacities, fighting, toiling, and ministering by turns. If a diary of the events of their pioneer-lives had been kept by each of these brave and faithful women, what a record of toil and warfare and suffering it would present. How many different types of female character in different spheres of action it would show — the self-sacrificing mother, the tender and devoted wife, the benevolent matron, the heroine who blenched not in battle! Unnumbered thousands have passed beautiful, strenuous and brave lives far from the scenes of civilization, and gone down to their graves leaving only local, feeble voices, if any, to celebrate their praises and to-day we know not the place of their sepulcher. Others have had their memories embalmed by the pens of faithful biographers, and a few also have left diaries containing a record of the wonderful vicissitudes of their lives. Woman’s experience of life in the wilderness is never better told than in her own words. More impressible than man, to passing events; more susceptible to pain and pleasure; enjoying and sorrowing more keenly than her sterner and rougher mate, she possesses often a peculiarly graphic power in expressing her own thoughts and feelings, and also in delineating the scenes through which she passes. A woman’s diary of frontier-life, therefore, possesses an intrinsic value because it is a faithful story and at the same time one of surpassing interest, in consequence of her personal and active participation in the toils, sufferings, and dangers incident to such a life. Such a diary is that of Mrs. Williamson which, in the quaint style of the olden time, relates her thrilling experience in the wilds of Pennsylvania. We see her first as an affectionate, motherless girl accompanying her father to the frontier, assisting him to prepare a home for his old age in the depths of the forest and enduring with cheerful resolution the manifold hardships and trials of pioneer life, and finally closing her aged parent’s eyes in death. Then we see her as a wife, the partner of her husband’s cares and labors, and as a mother, the faithful guardian of her sons; and again as a widow, her husband having been torn from her arms and butchered by a band of ruthless Indians. After her sons had grown to be sturdy men and had left her to make homes for themselves, she shows herself the strong and self-reliant matron of 50 still keeping her outpost on the border, and cultivating her clearing by the assistance of two black men. At last, after a life of toil and danger, she is attacked by a band of Indians and defends her home so bravely that after making her their captive they spared her life and in admiration of her courage, adopt her into their tribe. She dissembles her reluctance, humors her Indian captors and forces herself to accompany them on their bloody expeditions wherein she saves many lives and mitigates the sufferings of her fellow captives. “One night the Indians, very greatly fatigued with their day’s excursion, composed themselves to rest as usual. Observing them to be asleep, I tried various ways to see whether it was a scheme to prove my intentions or not, but, after making a noise, and walking about, sometimes touching them with my feet, I found there was no fallacy. My heart then exulted with joy at seeing a time come that I might, in all probability be delivered from my captivity; but this joy was soon dampened by the dread of being discovered by them, or taken by any straggling parties; to prevent which, I resolved, if possible, to get one of their guns, and, if discovered, to die in my defense, rather than be taken. For that purpose I made various efforts to get one from under their heads (where they always secured them) but in vain. “Frustrated in this my first essay towards regaining my liberty, I dreaded the thought of carrying my design into execution: yet, after a little consideration, and trusting myself to the divine protection, I set forward, naked and defenseless as I was; a rash and dangerous enterprise! Such was my terror, however, that in going from them, I halted and paused every four or five yards, looking fearfully toward the spot where I had left them, lest they should awake and miss me; but when I was about two hundred yards from them, I mended my pace, and made as much haste as I could to the foot of the mountains; when on sudden I was struck with the greatest terror and amaze, at hearing the wood-cry, as it is called, they make when any accident happens them. However, fear hastened my steps, and though they dispersed, not one happened to hit upon the track I had taken. When I had run near five miles, I met with a hollow tree, in which I concealed myself till the evening of the next day when I renewed my flight, and next night slept in a canebrake. The next morning I crossed a brook and got more leisurely along, ret iming thanks to Providence, in my heart, for my happy escape, and praying for future protection. The third day, in the morning, I perceived two Indians armed, at a short distance, which I verily believed were in pursuit of me, by their alternately climbing into the highest trees, no doubt to look over the country to discover me.